The FedEx Sanford, Florida civil site engineering was designed and permitted by H & H Engineering. The project consisted of developing about 20 acres of existing Plant Nursery, pasture land wood land area into an FEDEX distribution center. Phase 1, consisted of preparing the design for a 120,000 SF building which included the civil design for the geometry layout of the building with parking and the storm drainage with retention ponds and the paving and grading design. The water system was connected to an existing water main near the site and the sanitary sewer design consisted of the design of a lift station design and force main to an off site existing force main to the east. The site plans were approved for construction in 2005 and the site was developed and operational by 2006. The picture to the right shows the north wet retention pond and the new FedEx facility after construction. The civil engineering permits were obtained by H & H Engineering. Phase 2, of the design consisted of adding an additional 50,000 SF of building area to the existing building and enlarging the parking and driveway area. The design and permitting was started in 2013 and the project was completed and the addition to the building was constructed in 2014. View of the FedEx site after construction of phase 1. The FedEx site plans were developed to give the best use of land available and to meet the requirements of the City of Sanford, Seminole County and the St. Johns River Water Management District. (SJRWMD) The site included wetlands that also had to be permitted. The picture to the right shows the south wet retention pond with the FedEx building in the background. Workable planning and Layout of the Building and parking area based on the initial layout furnished by FedEx. Design drawings for the geometry plan that met City standards and code. Storm water retention pond design for the site per SJRWMD and City standards. Coordinate with the environmental specialist on the wetlands approval for this site. Design and prepare drawings and details for the fire protection and potable water use for the site. Design and prepare drawings for the sanitary sewer connection to an off site sewer system. Design of lift station and sanitary sewer force main. Prepare detail plans for the drawings per city and county standards. Submit plans to the City, FDEP and SJRWMD for review and approval. Prepare asbuilt drawings for the completed project. 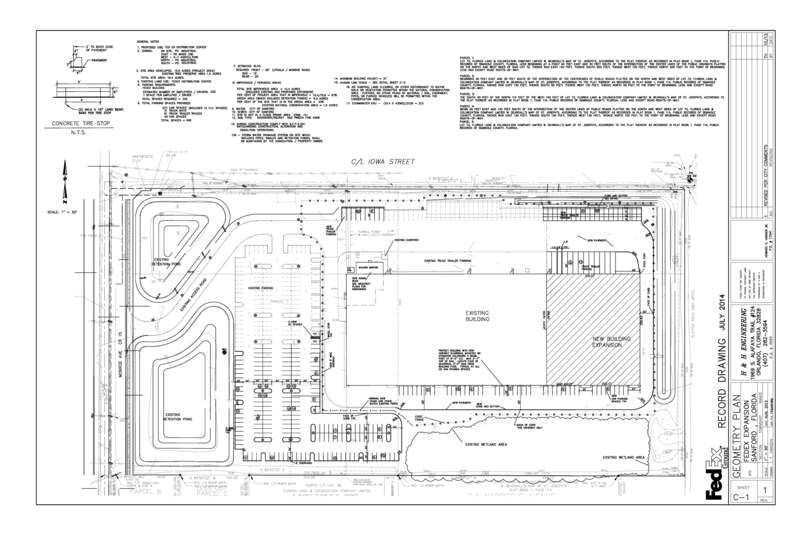 The site plan as shown above was for phase 2 of the site, which consisted of providing new site plans for the addition of 50,000 sf of building area and new parking and driveway area. This is the geometry plan for the As-Built plan.